Climate change no doubt played a role in the disaster, as warmer water generally feeds stronger storms. This season has seen a greater number of powerful, land-falling storms than the past few years combined. Four were Category 4 or 5, and three of them made landfall in the U.S.—a unique event in modern records. Puerto Rico is also vulnerable to rising seas: since 2010, average sea levels have increased at a rate of about 1 centimeter (0.4 inches) per year. And the process is accelerating, leading to erosion that’s devastating coastal communities. Even before the storms, Puerto Rico’s economy was in a tailspin. It depends largely on manufacturing and the service industry, notably tourism, but the prospects for both are dismal. The island’s population is shrinking as more and more people seek opportunities in the continental U.S.. Puerto Rico depends entirely on imported energy sources—including bunker oil for some of its electricity production, plus natural gas and coal. The Puerto Rico Electric Power Authority (PREPA) is a law unto itself, a monopoly that appears mismanaged (long close to bankruptcy), autocratic, and opaque. Over 80 percent of food is imported and the rate of car ownership is among the highest in the world (almost a car for each islander!). To top it off, Puerto Rico is also in the throes of a debt crisis. The Commonwealth owes more than $70 billion to creditors, with an additional $50 billion in pension obligations. Puerto Rico’s government has been forced to dramatically cut spending and increase taxes; yet, despite these drastic measures, the situation remains bleak. 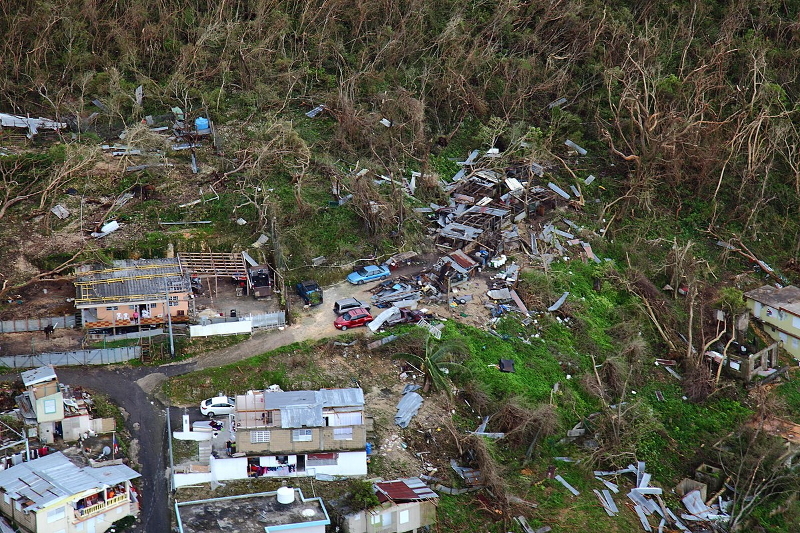 In June 2015, Governor Padilla announced the Commonwealth was in a “death spiral” and that “the debt is not payable.” On August 3 of the same year, Puerto Rico defaulted on a $58 million bond payment. The Commonwealth filed for bankruptcy in May of this year after failing to raise money in capital markets. A shrinking economy, a government unable to make debt payments, and a land vulnerable to rising seas and extreme weather: for those who are paying attention, this sounds like a premonition of global events in coming years. World debt levels have soared over the past decade as central banks have struggled to recover from the 2008 global financial crisis. Climate change is quickly moving from abstract scenarios to grim reality. World economic growth is slowing (economists obtusely call this “secular stagnation”), and is likely set to go into reverse as we hit the limits to growth that were first discussed almost a half-century ago. Could Puerto Rico’s present presage our own future? Obviously, the Puerto Rican people have immediate needs for food, water, fuel, and medical care. We mainland Americans should be doing all we can to make sure that help reaches those in the throes of crisis. But Puerto Ricans—all Americans, indeed all humans—should be thinking longer-term about what kind of society is sustainable and resilient in this time of increasing vulnerability to disasters of all kinds. Every time that I see hurricane damage, it hits me like a sharp punch right in the stomach. The reason is that I have already gone through this devastation. So it is a reopening of a raw wound that will never fully heal. I write of my own loss here at Countercurrents: The Times Ahead: Catastrophes, Resource Conflicts And Cooperation. … Unless you’ve gone through the utter loss, you can’t imagine its impact on your life and the associated pain, which never ever completely goes away. Now the fact is that 5 percent of the world’s population (USA population) uses 15 percent of energy resources and creates 20 percent of pollution. Terrible as that is, the desire for energy in my country, and in any other one, is not going to end any time soon. … Yeah, yeah — people can wring their hands about climate change, but it is not going to change the behavior of most people in terms of energy use. So the benchmark or baseline for climate change is going to keep ramping upward into worse and then more worse scenarios. So if anyone thinks that the way that everything is going now with climate change horrors is bad, well … brace yourself for much harder times to come as hurricanes worsen, oceans rise, shellfish animals diminish due to ocean acidification and large parts of the globe become uninhabitable as the human population continues to simultaneously climb and climb. The majority of people around me where I live in MA, USA want more and more — not less — energy. They will not stop using ever more. Likewise they will not delimit economic growth by destroying the natural world for development and financial opportunity until forced to do so. At some point due to increasing energy use and development, it will be an ugly world not able to support the human numbers trying to eek out a living on it, especially as human numbers keep climbing. So I grieve for Puerto Rico … but for so much more at the same time. It’s because I see the hell that is coming and there is no way that I, alarmed at the coming scene ahead, can stop it from happening.